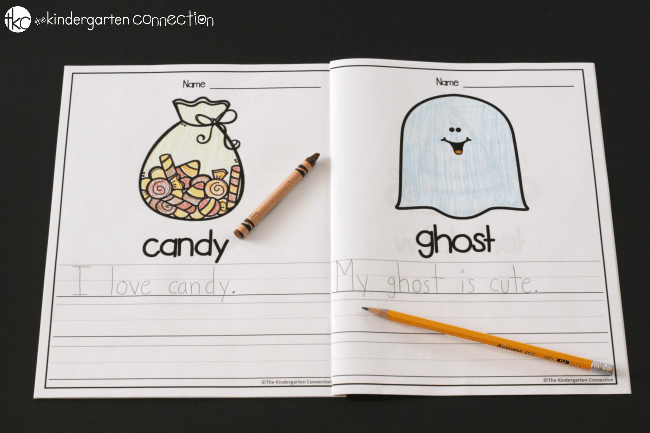 Halloween Writing Centers for Kindergarten - Month of Activities! Halloween center prep just got so much easier with our Halloween Writing Centers for Kindergarten! 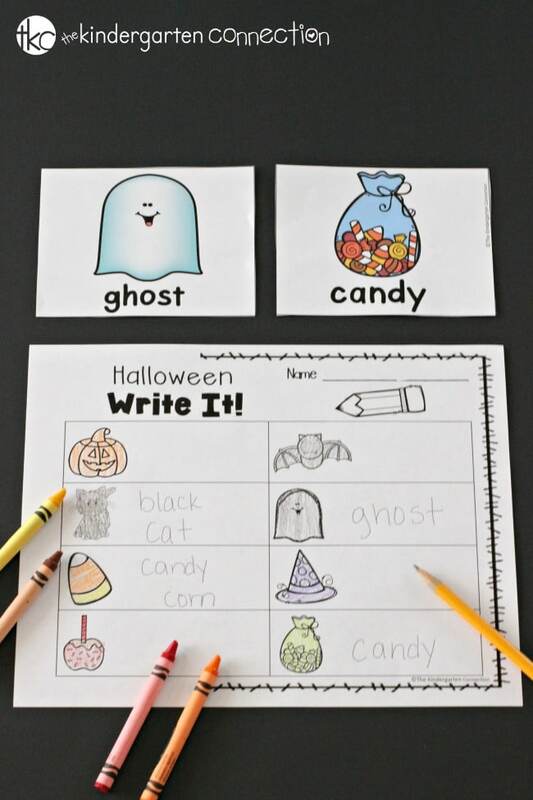 These Halloween writing centers are perfect for early writers to practice labeling, building vocabulary, sentence writing, and more! Grab these Halloween Writing Centers in our Teachers Pay Teachers store on their own, or save BIG and get writing centers for the entire year! Like all of our writing centers, once kids know the routines, they are able to do them completely independently. That’s right – you won’t have to teach the activities over and over as if they were brand new! I give instructions early in the year with our Back to School writing centers, and then as I change out themes throughout the year, kids know what to do and I am not wasting precious writing time (because we know that kids get better at writing by actually writing) reteaching routines or giving instructions – that’s a win! 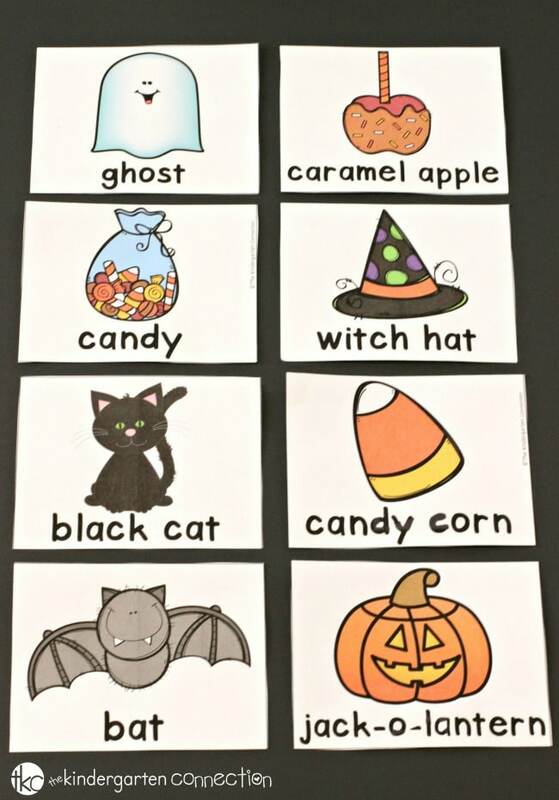 These Halloween Writing Centers vocabulary cards showcase our favorite Halloween characters: bat, jack-o-lantern, black cat, candy corn, witch hat, candy, caramel apple and ghost. 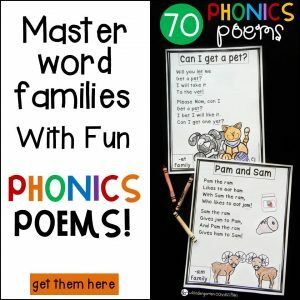 The vocabulary cards come 4 to a page (8 words total) and are the perfect size to go along with all of the activities. I cut them out and laminate them for durability before adding them to the writing center. This is one of our favorite activities to use the vocabulary cards with! This is like a traditional “write the room” activity, and you can choose how you use it with your students. 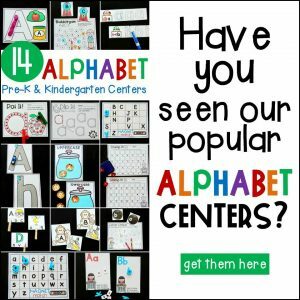 You can have the recording sheets at the table with the cards in a pocket chart for the kids to see and simply record, you can hide them in a sensory bin, or you can post them all around them room on the walls and let kids walk around with clipboards as they label the pictures. However you decide to do it, it’s always a hit! I like to use this Mini “Write It!” book for the beginning of the Halloween season as a great way to introduce the new vocabulary. This way, my students are prepared with prior knowledge of the terms as we work through the rest of the Halloween Writing Center activities. Each page of our mini “write it!” book contains a picture that matches a labeling card, and a space for the students to write the word and then color the picture. 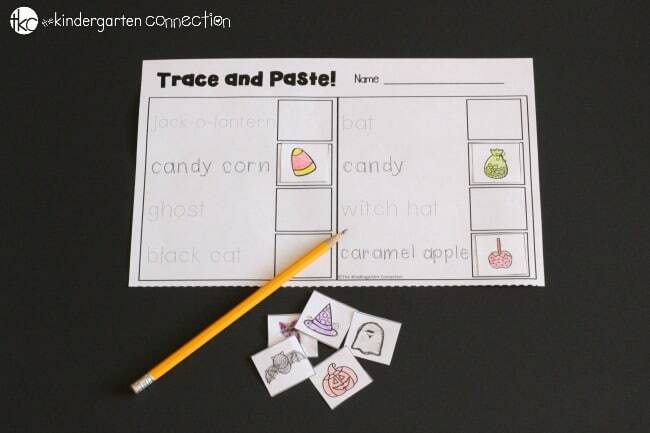 Work those scissor cutting skills with the “Trace and Paste” activity! 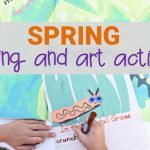 It’s a great small group activity or whole class as well. Just trace over the words, then cut and paste the matching pictures next to them. Tip: Students can use the vocabulary picture cards to help! 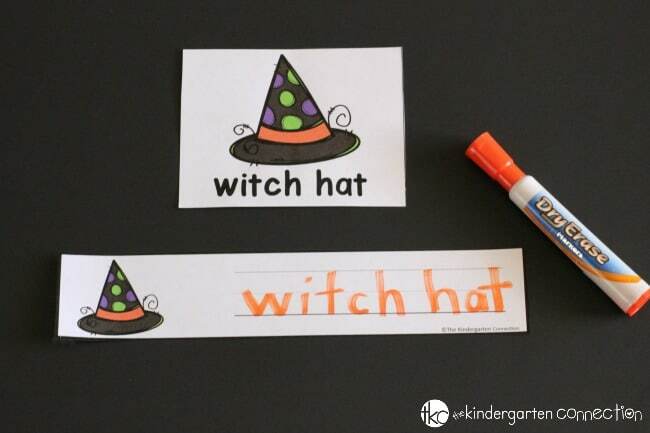 Break out the dry erase markers for this activity! 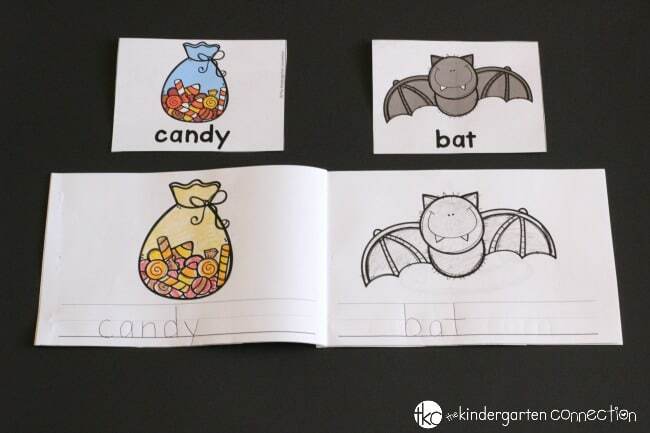 Your students will have a blast using our Halloween Vocabulary Sentence Strips for practicing writing skills as well as building up vocabulary words! Just print the strips, laminate them, and then add them to a writing center with the vocabulary cards. Frugal Tip: We like to use clean kid socks as erasers. They make perfect storage for the markers, too – just slip them inside! The possibilities are endless for our Halloween Story Book! It is great for a continued project or themed journal. 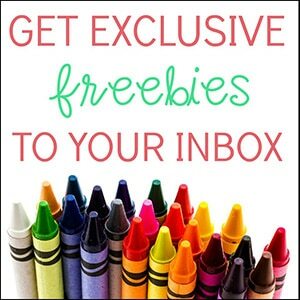 You could even send it home for kids to work on writing with their families! You can print the pages double sided and use the cover page to create a journal, or you can just use single pages as writing sheets in the writing center if you prefer. 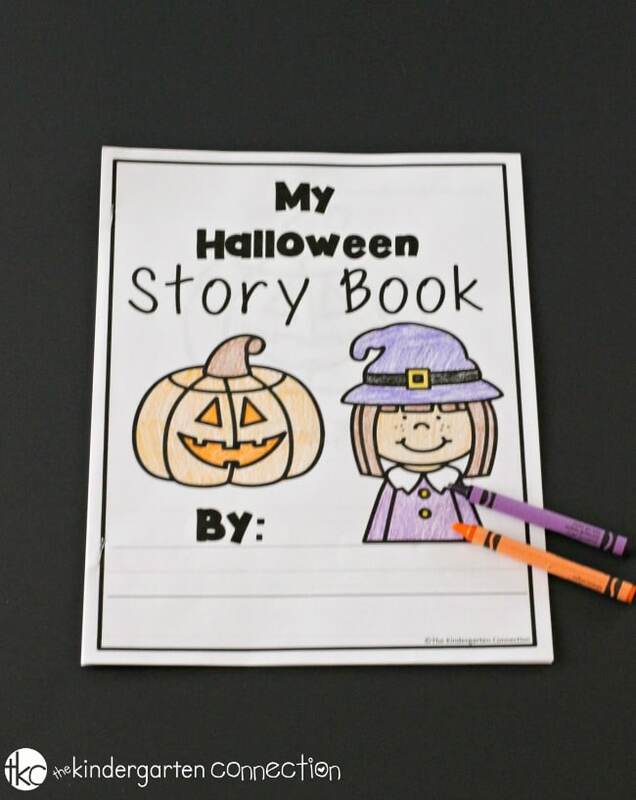 The goal is for kids to write a few sentences or a short story about the Halloween-themed picture. In Kindergarten this may look a variety of different ways. You may have scribbles and then the written vocabulary word that they copied. You may have just the vocabulary word written several times, or you may have an actual sentence or two. All are ok! The goal is to get the students writing where they are at and enjoying it. 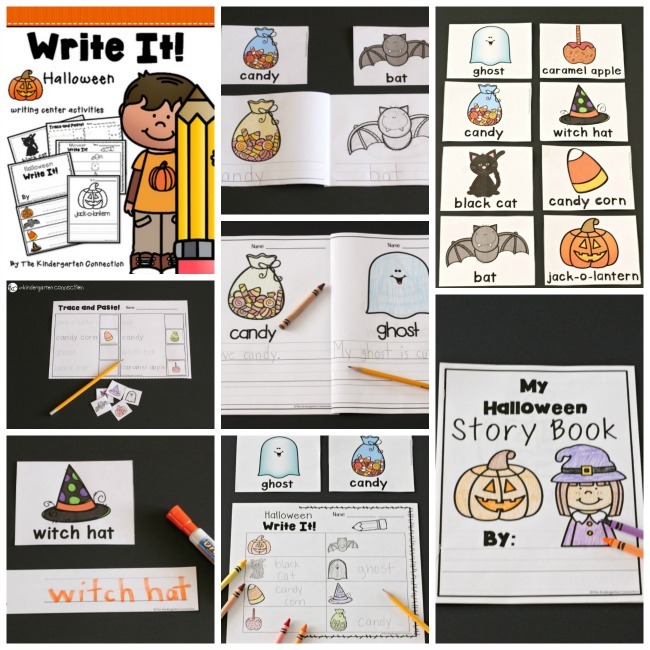 There are tons of “spooktacular” Halloween writing activities in this pack! Frugal Tip: All the colored pages such as the vocabulary cards and strips also come in black and white to save you ink if you choose. 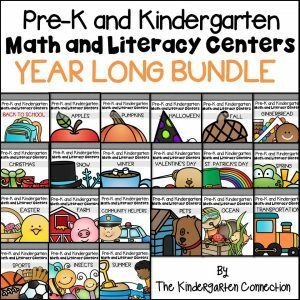 Grab the centers below and have writing centers fully done and ready to go for you and your class this Halloween season! Ready for tons of Halloween-themed writing fun? 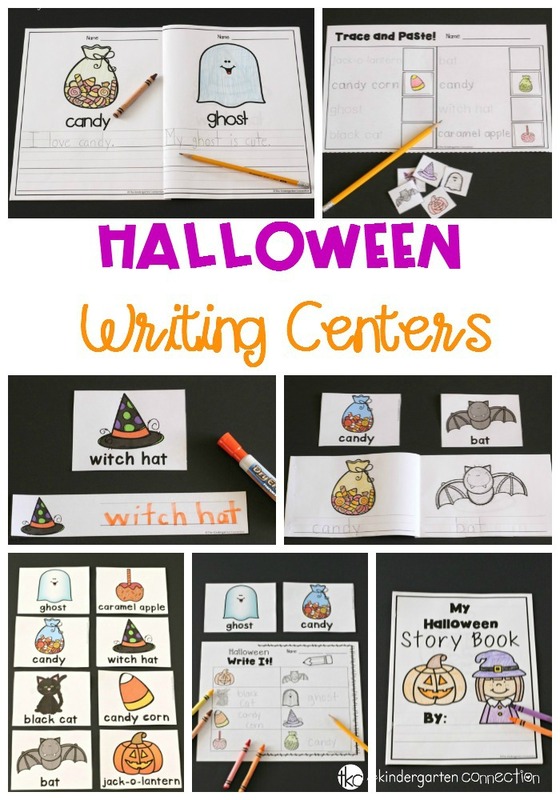 Grab your copies of these Halloween writing centers and activities in our Teachers Pay Teachers shop on their own, or in a money saving bundle of writing center activities for the year!